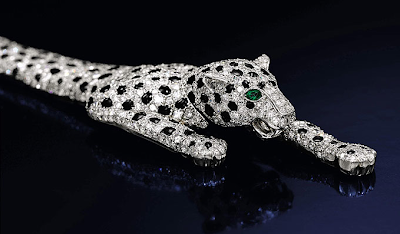 The Sun is reporting that this diamond and onyx encrusted panther bracelet, once belonging to Wallis Simpson, has been auctioned off by Sotheby's in London for a staggering £ 4.5m, or just over 7 million dollars. That is one pricey pussycat! Simpson was the wife of Edward VIII, who gave up the throne of Great Britain to be with her, after their controversial courtship caused shock waves through the country. The bracelet was purchased by an anonymous buyer, however the paper notes that "Madonna had shown an interest."